I'm always hesitant to say that fall is my favorite season. Mostly because I really don't like the cold and winter and I are not friends. But there's something I love so much about this time of year. It's almost magical, don't you think? 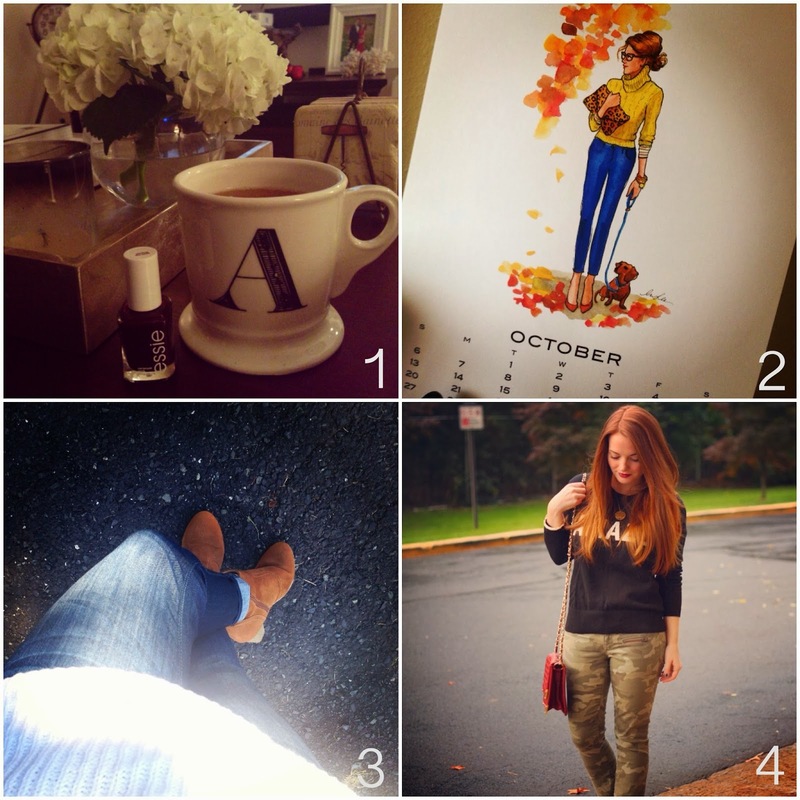 Below are a few of my favorite recent fall-related snapshots taken from my Instagram. Be sure to follow along for all the latest! 1. All I want to do once the cool weather settles in is cozy up in sweatpants, read magazines and paint my nails while sipping hot apple cider. This color, "Skirting the issue" by Essie, is one of my go-to fall shades! 2. I always look forward to changing my Inslee calendar each month. October's drawing is one of my favorites! 3. My fall uniform as of late: a cozy sweater, skinny jeans and booties. Similar sweater here and boots here. 4. Have been wearing these camo skinny jeans non-stop. Check out my outfit post from last week to see more! 5. 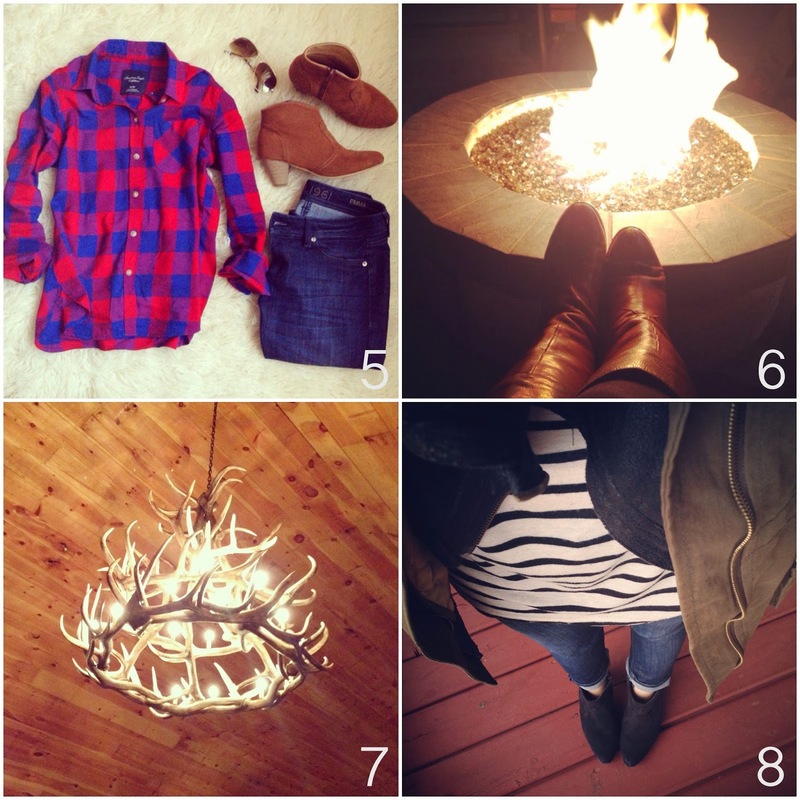 Another fall staple: anything plaid! I gushed about this shirt on Friday and wore it this past weekend to travel to Ohio. 6. Speaking of Ohio, it was fa-reezing there! Fire pits were one thousand percent necessary. See also, #8. 7. The wedding we attended was in a gorgeous barn with the most amazing ambiance. I wish this picture did justice to the incredible antler chandelier that was in the center of the room! 8. Layers were in no short order! I wore my military-style jacket all weekend and paired it here with a striped tee (love this one) and black booties (similar).